My approach to shooting is semi photo journalistic. My hope is that you don't see me as the photographer anywhere in my images - I want everything to appear as though a true, authentic moment was just frozen in time. I aim for authenticity and timelessness and I love for my images to portray a kind of quiet stillness. I love candid moments and creating movement in my shots. Stylistically, I shoot and edit very light, airy, and film-like and I love the colors and feel that that produces. 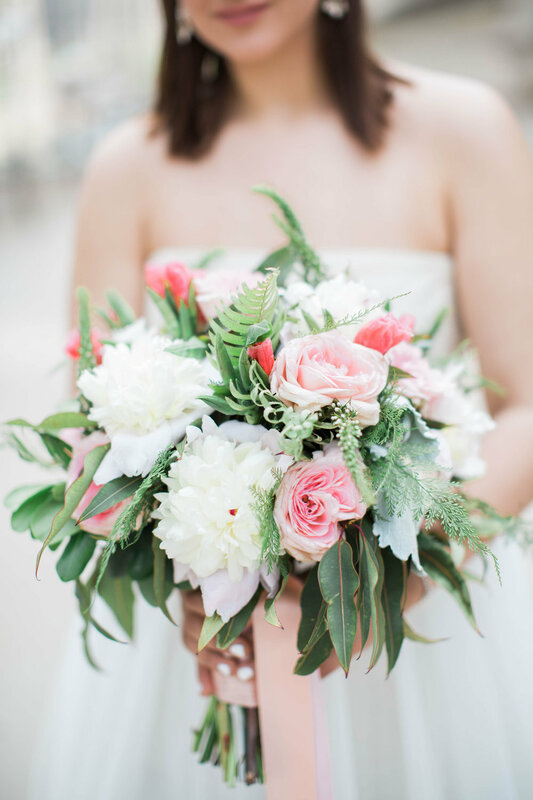 I love shooting close up detail shots and am a big fan of photographing anything blush pink, big beautiful bouquets, and architecture/stairs. I'm a portrait & fashion photographer who aims to capture the beauty within every individual. I'm dedicated to help my clients feel comfortable and provide them with clean/sharp images. I enjoy photographing outdoors using as much natural light as possible and work with different environmental setting as a backdrop. I mainly started focusing on fashion and portrait photography while getting my photography degree. I wanted to expand more during my last semester, so I decided to branch out to add couple and wedding photography. As much as I love fashion, I've always have the heart to capture the love and special moment between couples. And don't get me started about the gorgeous brides, bridal gowns, and floral arrangements! It will be the best of both worlds if I get to photographed your wedding day! Though I am currently serving in the Chicagoland area, I am willing to travel to other states within the US as well as other countries. I have a bright and playful style and I love capturing genuine and joyful moments. Seeing true emotion in my clients faces during our session together is what I aim for when I'm shooting. The way he looks at you, or the way you giggle in his ear, or how he tickles your side because he knows that's your weak spot to make you laugh - these are the moments I love, and these are the moments I capture.